The combination of Waikato Stud and Victorian trainer Danny O’Brien added a whole new tier to its successful relationship on Saturday. Since the dual Gr.1 winning relationship forger Glamour Puss in 2004, the Melbourne trainer and the Waiakto Stud bred and raced products have toasted black-type success with such horses as Glam Slam, Breezy, Be Delicious, Sparkling Satine and Splashing Out. It’s a combo made all the more potent when considering the Waiakto Stud-bred likes of Keano, Vigor, Take The Rap, Crepe De Chine and Escadaire have all provided black-type reward for O’Brien’s clients. On Saturday, the new chapter dawned when Shopaholic - a Pins daughter of the racemare Splashing Out, took out the Gr.3 Vanity Stakes (1410m) at Flemington, which also just happened to be O'Brien's 100th winner on his hometrack as a trainer. "I was absolutely thrilled with Shopaholic’s win," said O’Brien. "It’s the first time that we’ve won a stakes race with a daughter of a filly that we also won a stakes race with. It’s just great to see Splashing Out, who won Caulfield’s Gr. 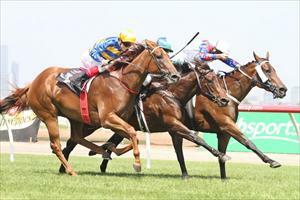 3 Thoroughbred Club Stakes (1200m) for us, go home and become a successful broodmare at first attempt. I got a real buzz out of it." Looking back, the parallels between the two are clear for O’Brien. "They are both very genuine. They aren’t overly big, but they are tough and they try hard. Importantly, both share plenty of ability and are high class individuals," he said. Looking ahead, O’Brien reports that Shopaholic pulled up well and could potentially back up in this weekend’s Gr.2 Angus Armanasco Stakes (1400m) at Caulfield, before making an assault on the Gr.2 Kewney Stakes in March. With a proven black-type association and targets ahead such as this, O’Brien is understandably excited about times ahead. "I’ve always really enjoyed training for Waikato. We’ve had a lot of fun together and I really look forward to this next generation."